Only to be sold during Joe Ellis Trust Fund charity events. 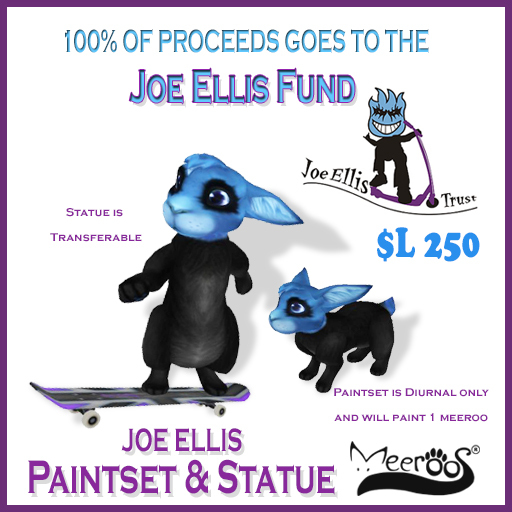 ALL proceeds from the sales go directly to the Joe Ellis Trust Fund. Read more about 72 HOUR FLASH SALE!! Working with the roo community we have put together a series of changes to the WWoM genetic panels. COME SKATEBOARD WITH US FOR CHARITY !!! 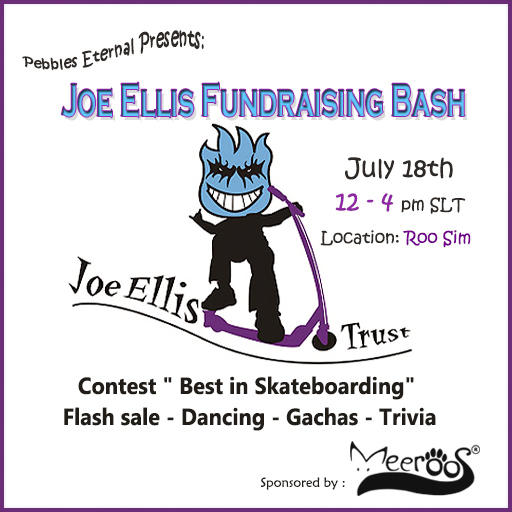 You are all invited to a skateboard themed party on the 18th of July from 12 - 4pm SLT on the Roo Sim. Dance to the sound of 3 different Dj's ?? Contest for "best in skateboarding"
Read more about COME SKATEBOARD WITH US FOR CHARITY !!! Estella Mystagic (mystagic): no code is changed, it was a tome mistake, the vulpine tail was always meant to be a complement to the vulpine head that also is on pure borns, nothing strange happening here, just a mistake in the tome that is corrected. so very sorry for any inconvenience this might have caused. Read more about INCORRECT TOME ! - the original 4 meeroo parents - Diurnal and Nocturnals are not included in the contest. - One winner for oldest Diurnal and one winner for oldest Nocturnal. Read more about Birthday Contests!! MAY 16TH 12 NOON SLT !! PARTY TIME !!! 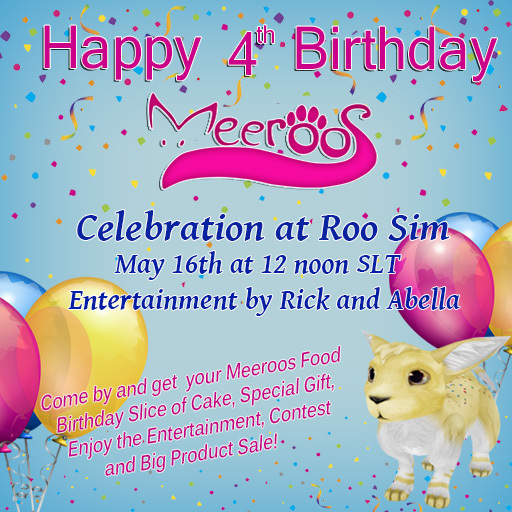 Make sure you save the date and time and come down to the Roo sim and help us all celebrate the 4th Birthday of the Meeroos. 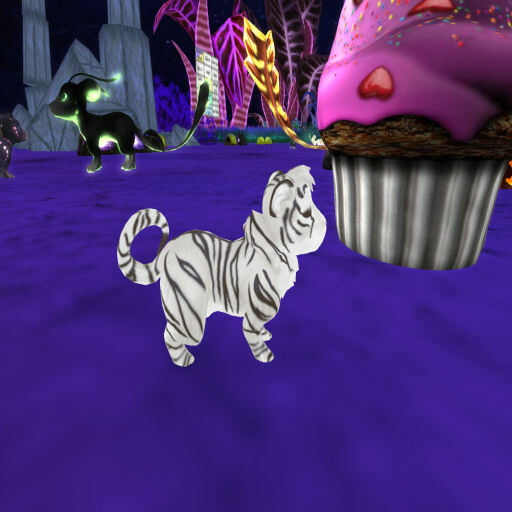 Read more about MAY 16TH 12 NOON SLT !! PARTY TIME !!! TUESDAY MAY 5TH, SERVER REBOOT! PLEASE READ! OUR SERVERS WILL BE REBOOTED. any ROOS or NESTS during this time. This process can take several hours and we do not have a definitive time frame. We will give the all clear once things are back up and running. Read more about TUESDAY MAY 5TH, SERVER REBOOT! PLEASE READ! St. Patrick's Day on Roo Sim! St. Patrick's Day, on March 17, remembers one of Ireland’s patron saints, St Patrick. It largely celebrates Irish-American culture in the United States. 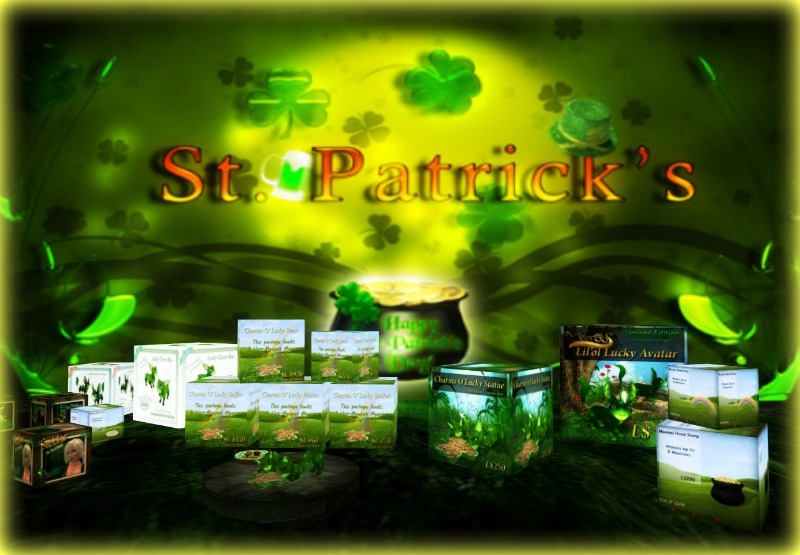 Read more about St. Patrick's Day on Roo Sim! Moxie never ceases to amaze us, does she? She has come up with the most brilliant idea for those of you that love to put statues in your garden or anywhere on your sim. But of course, those statues were all kinda prim heavy, right? We now have a solution for all that. Come take a look at the new mesh 1 prim statues with customizing hud choices. Read more about BRILLIANCE !! Read more about ROYAL BENGAL ! !